The last two weeks of July are typically the hottest weeks of the summer — the perfect time to protest the industry that is exacerbating this extreme weather. Summer has been the season of climate action for the past two years. In August 2011, 350.org’s Tar Sands Action made the Keystone XL pipeline a national issue and reinvigorated the climate justice movement with 1,253 arrests outside the White House. That momentum continued through last summer, when a range of anti-fossil fuel campaigns around the country united under the banner Summer of Solidarity. 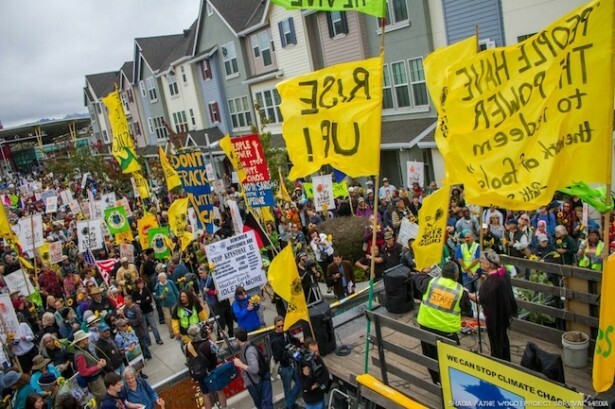 Key actions were held against mountaintop removal in West Virginia, fracking in the Northeast, coal exports in the Northwest and tar sands in Texas. The various struggles against fossil fuel extraction have only grown more sophisticated in the last year. And now, this summer, a number of action-based initiatives have sprung up. There’s Fearless Summer, which includes many of the same groups who took part in last year’s Summer of Solidarity; Sovereignty Summer, which is following on the wave of indigenous action sparked by Idle No More; and Summer Heat, organized by 350.org. In order to understand how all these initiatives, campaigns and struggles fit together into the larger climate justice movement, I spoke with 350.org actions team coordinator Matt Leonard, who has been one of the leading organizers in the environmental movement for over a decade. How did the idea for Summer Heat come about? In the past few years we’ve really seen the public making stronger connections between extreme weather events and climate change. Hurricane Sandy was a big wake-up call for this, but so were the massive floods throughout the world, intense wildfires in the West, historic drought conditions along the Mississippi and more. The last two weeks of July are typically the hottest weeks of the summer and rather than just see people suffering or complaining about it we felt we should focus that outrage on the industry that is continuing to exacerbate this extreme weather. The goal was to support grassroots communities in leading big mobilizations against the fossil fuel industry. Our movement does a lot of “Days of Action,” which can often bring a focus to a specific issue, but can also sometimes feel a bit arbitrary in when they occur. With Summer Heat we wanted to draw attention to this period of the summer and offer the movement a framework to focus pressure on the industry, while still giving the space for grassroots groups to have flexibility in their plans. How does Summer Heat compliment or differ from the many other summer initiatives going on, like Fearless Summer and Sovereignty Summer? Did you coordinate with those organizers? We coordinated with quite a few of those organizers, and see these efforts as all very complimentary. Our theory of change was that as a movement we often organize days of action or actions that are relatively small and hope that those small actions add up to something larger. But that doesn’t always happen and sometimes these smaller events or actions leave us speaking to the chorus of existing activists or, worse, leave us feeling disempowered because it’s the same people we always organize with or see in the movement. With Summer Heat, our explicit framing was to support grassroots groups in organizing mass actions that could break into the public consciousness and really grow the movement with new constituencies and voices. We realize that one of 350.org‘s big assets is having a large email list and a big voice in the movement and media. We constantly hear from our base and network that they want more opportunities to engage in mass mobilizations and civil disobedience, and we felt that sharing these assets with grassroots groups was key. But rather than encourage 500 people to organize small actions with 5 or ten people, we’d rather see ten big, well-organized actions that could engage large numbers of people. We felt right now that this type of event could better reflect the power of the movement, be more transformative for participants and, most importantly, build more leadership and resources for grassroots groups. So we focused our efforts on supporting a smaller number of actions that could resonate with a broader swath of the public, help align diverse coalitions and groups, and that we could do lots of outreach for publicly. All of these actions were led by grassroots groups, mostly by volunteers. This model of organizing is often very different than how other big large-scale events come together, where staff from NGO’s do most of the planning and coordinating. It sometimes meant that events stumbled a lot along the way and that there were lots of long, late-night meetings. What Summer Heat actions have taken place so far? There is a full list here with some cool write-ups. But we actually just wrapped up the actions last weekend. We had 3,000 people mobilize in Richmond, Calif. at the Chevron refinery — one year after an explosion there sent 15,000 people to the hospital. It was a historic coalition of over 30 labor unions working alongside climate activists, urban farmers, youth, Occupy groups and more. Two hundred and nine people were arrested in a mass trespass onto the property, pushing past police lines with a huge group. It was super diverse and included a 90-year-old grandmother, labor union members, Richmond residents and climate activists. We’re debriefing with local organizers to see what went well in this approach, what lessons were learned, and how we can support them in next steps. Nationally, we’re looking at how to keep scaling up mass actions, where local actions can be supported to become regional ones, where regional ones can become national, and how we can strengthen an international climate movement generally. How do you see Summer Heat building upon the work 350 has done over the past year, from maintaining pressure against the Keystone XL pipeline to supporting a fossil fuel divestment movement to organizing a massive youth climate conference? Part of Summer Heat was for the movement to see itself more broadly, to see our common threads. Oftentimes, people get tunnel-vision on the immediate campaign they are working on — whether it be specifically on a local project or even something like Keystone XL. But in the end, anti-fracking activists have a lot in common with a clean energy activist. We’re often fighting for similar values, against the same challenges. We saw Summer Heat as a way to expand the movement to not just think of itself in isolation against coal, oil or gas, but as broadly challenging the entire fossil fuel industry. Are you feeling optimistic about the larger climate justice movement at the moment? How far do you think it’s come since the launch of tar sands action? We’ve been steadily gaining power and have totally re-shaped the landscape on climate issues. The public is increasingly understanding the importance and urgency of the climate crisis. We are collectively identifying the major roadblock to transforming our energy economy, which is the fossil fuel industry. We’re creating opportunities for people to engage in the movement at every level — whether you identify as an activist on the street, a college student, a church member or a doctor. Climate is a dinner-table topic for much of the country, but we’re at a place where a vibrant grassroots movement is leading the way, rather than a few NGO’s who are overly focused on top-down campaigns or on passing federal legislation without a real base of support or political power. I think we’ll see a lot more communities raising the bar on climate in term of bolder actions that won’t allow the issues to be sidestepped or de-prioritized in society. I think extreme weather events are increasingly galvanizing unlikely allies to become vocal and engaged on the issue. I think we’ll see bolder actions that aren’t just delaying or stopping specific projects, but that call into question the legitimacy and social benefits (or lack thereof) of the entire fossil fuel industry, and that message will increasingly resonate across society. In short, our movement won’t just be talking about the urgency and seriousness of the climate crisis — our actions will reflect it.